Incorporating all of the strength and features of the 4000 Series the 4200 FROZEN MIXER MINCER has been designed and constructed to withstand the higher forces and demands of processing hard frozen product. The construction of the HEAVY DUTY REINFORCED BOWL AND PADDLES have been STRUCTURALLY ENGINEERED to process TEMPERED BLOCKS size of 150 x 150 x 400mm at -1°C. FROZEN BLOCKS OF MEAT 50MM CUBE OR FLAKED AT -10°C THROUGH A MINIMUM HOLE PLATE OF 8MM DIAMETER. The FROZEN FEEDSCREW is uniquely designed with an INFEED BELLOW in the channel to the barrel. This Bellow incorporated with the specific flight design to the feedscrew CUTS THE PRODUCT into small pieces and feeds to the CUTTING HEAD. POWERFUL MOTORS WITH HIGH TORQUE TRANSMISSIONS achieve HIGH PRODUCTION RATES ON COARSE MINCE with a hard dry product. 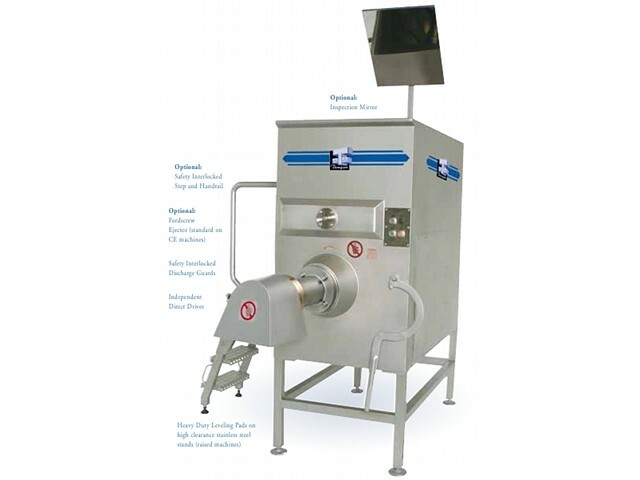 The 4200 frozen model is designed to break and mince the cold hard dry product - frozen meat. Built to handle the pre cut pieces of a frozen meat block the 4200F is ideal for FIRST CUT MINCING to 8 mm. If MINCING BELOW 8 MM HOLE PLATE SIZE is required it is recommended that an INVERTER UPGRADE MODIFICATION be made to the standard 2 speed machine. This upgrade can provide INFINITE SPEED CONTROL or our recommended 4 Speed Control at determined and pre-set speeds that will offer MAXIMUM PRODUCTION OUTPUTS for customer specific products at various frozen product temperatures. WITH THIS UPGRADE THE THOMPSON 4200 FROZEN MIXER MINCER IS CAPABLE OF MINCING A RANGE OF FROZEN PRODUCT THROUGH A 3 MM HOLE PLATE. With all the benefits of the 4000 SERIES MIXING system and incorporating the 2 SPEED MINCE MOTOR the 4200 FROZEN model is a very versatile machine to many production requirements. Used for FROZEN PRE-MINCING ON 1ST SPEED it can be as easily utilized for HIGH PRODUCTION PROCESSING ON FRESH MINCE OR SAUSAGE EMULSION ON THE HIGHER 2nd SPEED.